A landscaping pond’s purpose it to enhance the aesthetics and improve the environment and ecology of a yard or outdoor area. To preserve these aesthetics, you should know how to properly maintain your landscaping pond. There are a couple factors to consider in managing your pond such as size, content, location, and structural construction. Landscaping ponds consist of three components; a linear, a bed of sand, and edging materials, all of which may be constructed of different material. After understanding your pond’s elements, there are distinguishable seasonal practices that take the climate into consideration. Looking to bring beauty to your home while also acting environmentally friendly? With a a landscaping pond, you can enhance the aesthetics and improve the environment and ecology of a yard or outdoor area. To preserve these aesthetics, it is important to know how to properly maintain your landscaping pond, and we are here to help bring you helpful tips and guidelines that you can use to update your home today. Also, try adding lightweight rocks and stones to further beautify your pond. Spring– In the spring, drain the pond and clean the bottom of it removing muck and other debris. This is an often overlooked aspect when it comes to pond maintenance, but it is important for keeping your pond and backyard beautiful. Also, I would return any frost sensitive tropical plants that you had stored away for winter back into the pond. Additionally, at this time I also suggest that you check your pump and filter to make sure they are up to par. It is also important to keep fish in your pond thriving, and I recommend feeding them high-carbohydrate food. If you do not have plants in your pond, add oxygenating aquatic plants to increase the oxygen level in your pond’s water. Other aquatic plants I recommend inserting into your pond are floating and submerged plants which will take care of algae. Summer– In the summer, it is important to make sure your water level is where it needs to be, so that it is not too high or not too low. If your water levels are low and you need to add water, I highly recommend that you add small amounts of water often rather than dumping a large amount on one occasion. This is a helpful tip that home owners do not typically think of, but it can make a world of a difference for your pond. At this time I would also check the chemistry in the water making sure you do not have too much chlorine, salt or other elements in the water. If your pond does consist of fish, take a look at their behavior as this can be a direct correlation to the health of the water in your pond. Fall– This season will obviously bring upon leaves and other debris, especially if your pond is surrounded by trees. An option to prevent leaves from falling into your pond is putting a netting over your pond to catch the leaves. This will help keep your pond beautiful overall, and is a worthwhile investment for the future of your pond. At this time, I would also halt fish feeding because cool temperatures slows down digestion for fish. Winter– If you are in areas with harsh, cold winters and the potential of your water freezing, this season is very important to maintaining your pond. I would suggest floating an object such as a ball or a slab of wood on the water’s surface as it stagnates the expansion of freezing by absorbing pressure. Winter is a crucial time to watch your pond frequently, as the pond temperature can influence the life of plants and fish in the water. 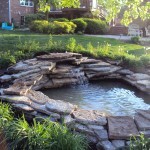 Still have questions about how to maintain your pond? Give us a call or email us today at (530) 243-3037 or sales@vichannan.com, we look forward to hearing from you soon!